Brookfield Multiplex has been awarded a $290 million contract by joint venture partners Frasers Property Australia and Sekisui House Australia to build DUO, the fifth stage of the $2 billion master-planned Central Park precinct. DUO is a mixed residential, commercial and hotel development on the corner of Broadway and Abercrombie Streets in Chippendale. It is made up of two 18-storey towers sitting on a combined five level basement car park. Designed by architects Foster + Partners, DUO’s residential component comprises 313 highquality apartments, the majority of which will be located within the eastern tower. Residents will have access to DUO Club facilities consisting of an indoor pool, jacuzzi, cardio room, yoga and recreation room, rooftop terrace and BBQ and residents’ lounge and dining room. The residential building is to be delivered as a 5 star green star design and as-built. The adjoining western tower will include a 297 room hotel, 5,500 square metres of commercial space, a large childcare centre to accommodate up to 90 children and the refurbished The Australian Hotel and adjoining terraces. At the peak of construction there will be a workforce of approximately 800 people. Central Park’s Project Director, Mick Caddey, said the joint venture team has successfully delivered over 1,400 residential apartments and more than 869 student dwellings at Central Park, accommodating a community of approximately 3,000 residents. “DUO’s two buildings pose a complex construction challenge due to the intricacy of the design and the various uses including hotel, pub, and heritage, commercial and residential,” said Mr Caddey. Complexities facing construction includes constructing feature off-form concrete cantilevered trusses over the heritage The Australian Hotel and terraces. There is also the challenge of the design, procurement and installation of complex glass façade elements which are a central feature of the towers and the concurrent completion of a major mixed-use development. 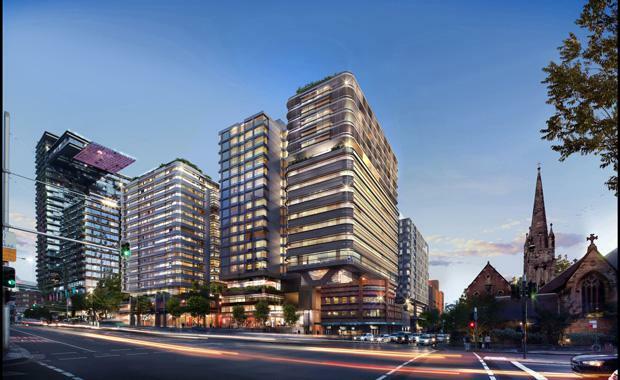 Mr David Ghannoum, Regional Managing Director NSW at Brookfield Multiplex, said the company was thrilled to be appointed to deliver the next mixed-use stage of the landmark Central Park precinct. “Brookfield Multiplex has extensive experience in the delivery of complex large-scale projects like DUO. It’s fantastic to be part of the vibrant and highly-sought after Central Park community,” he said. Completion of DUO is scheduled for April, 2018.